As part of the XPages development contest sponsored by WebGate Consulting AG which is part of the Appathon sponsored by IBM developerWorks, Andrew Luder has contributed a new release of this DominoDefrag project. Below is his description. 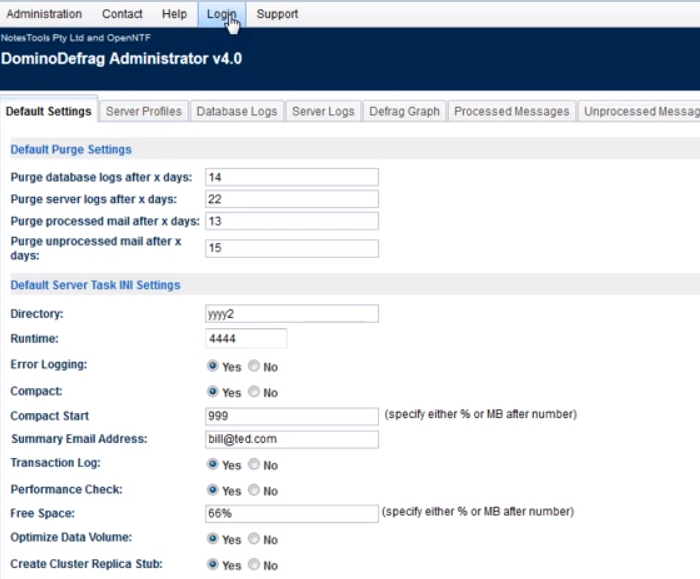 "DominoDefrag Administrator v4.0 database has a new Dojo tabbed container interface replacing the previous One UI v2.1. This Claro themed interface provides enhanced grids with pagination capability provided by the “ccDojoGrid” custom control. It also provides double click dialog opening functionality and Add and Remove buttons (utilised on in all tabs where a grid is required). Grids are populated by associated XML generating xAgents and views. A sidebar is also provided to display information and error messages. Double clicking on a message switches to the related tab." Watch the video to see the new UI in action.